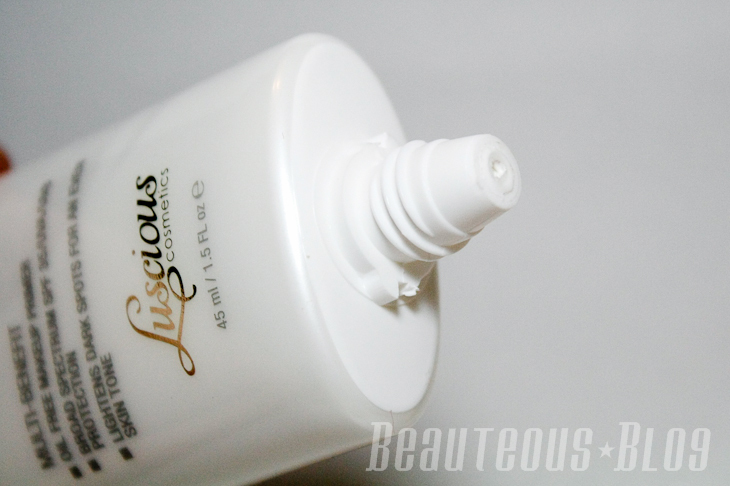 [REVIEW] Luscious Cosmetics Whitening Base SPF 35 -- New and Improved! A product that promises to be an all-in-one solution is something I always look forward to trying. 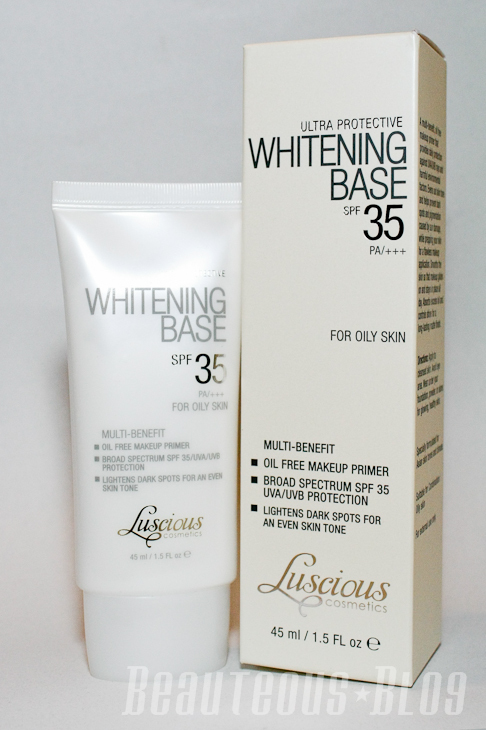 With the New and Improved Luscious Cosmetics Whitening Base for Oily Skin, it promises to be a high performance sunscreen, makeup primer, and an oil-free moisturizer all in one. By providing a smooth and even texture to your skin, this product helps to protect your skin from the sun while prepping it for makeup all while giving a bright appearance to your skin. So whats new and improved? The prominent change of the new version is the packaging. Previously the Whitening Base came in a short tube, now the product comes in a thinner squeezeable tube with a tiny opening. It dispenses the perfect amount of product since you need the smallest bit to cover your entire face. 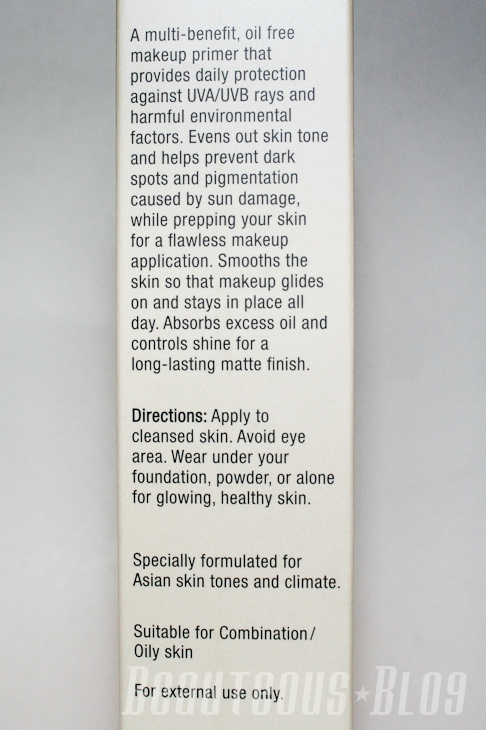 The product is a white creamy consistency, same as the previous version, which gives a sheer tint to your skin. 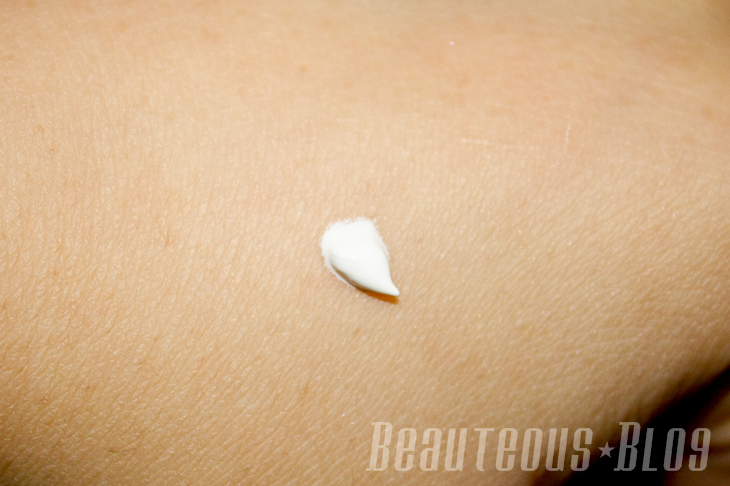 You only need a small amount of product to apply all over your skin. If you find that this leaves your skin looking too ghostly than you applied too much which was one of my first mistakes. 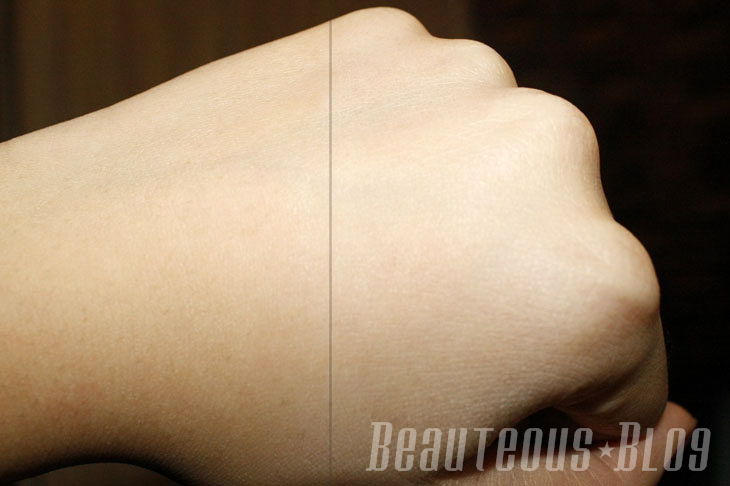 I blended out the product on the right side of my hand. This worked pretty ok for me since its the winter season, I am not sure how this would perform under humidity and heat. It evened out my skin-tone and gave a bit of moisture. I find that this product has replaced my moisturizer before I start my makeup, since I have an oily T-zone even the lightest formula moisturizer makes my skin feel greasy. I wish that it mattified my skin, after a few hours of using this my t-zone did get oily which I would expect a primer to help control the oil and keep my foundation on all day. It does however leave my skin feeling softer, the added SPF 35 is a great benefit with the formula. This also works really well to slightly minimize my pores. I love how this product feels on my face, it doesn't leave any sort of cakey appearance but it really brightens up the skin. I normally use this with my Bare Minerals Foundation in Medium Beige for daytime coverage and after 2-3 few hours my t-zone starting getting oily. I have tried this for an evening look just to see how it would work as a primer, I didn't notice a huge difference compared to not using it. I find this to be perfect for an everyday SPF with a hint of coverage but if you have really oily skin then don't expect this to keep your skin oil-free throughout the day. If you have dry skin and the previous version left your skin looking flaky then the Normal/Dry Whitening Base will help to hydrate your skin. For more information you can check out Luscious Cosmetics on Facebook. I love the honest review. I was actually thinking of buying, but now I don't think I will. Thank you for putting up this review! I didn't have the best experience with the first one and I was about to give this one a chance but now I think I'll save my money for something better! Sounds good :D Great review Sidrah, wish we had Luscious in India! Nice work with this review.. I've been searching for a good body lotion and I'm looking at various reviews online and been reading some great things about Parachute' advansed body lotion.. I would love to know what you have to say about that body lotion. @Zeenat I've never tried Parachutes body lotion but it looks promising! Ive always used Vaseline's body lotion and they work pretty well.